Gruyere cheese is a Swiss variety, named for the Swiss village where it was first developed. This cheese has fewer holes than commonly found in Swiss cheese and those holes are smaller. It's higher in fat than Swiss cheese, is aged longer and has great melting characteristics thanks to the fairly high fat content. When trying to prepare a traditional grilled cheese sandwich or set up a real Swiss fondue, you may need to find the best substitute for Gruyere cheese on the market. This will likely take a visit to a high end grocery store or specialty cheese shop. If possible, try to find a European cheese. Many American cheeses are made from skimmed milk, and low fat cheese just doesn't melt well. In addition, the fermentation process critical to the development of flavor and texture of Swiss cheese is hampered by pasteurization. If you can't get Gruyere or regular Swiss cheese, experts with The Cheese Shop recommend French cheeses such as Comte or Beaufort. Another option is the Norwegian cheese called Jarlsberg. 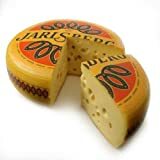 You may find Jarlsberg sold as Swiss cheese since they are quite similar. This rich, yellow cheese lacks the nuttiness of Gruyere but will melt beautifully. Butterkase cheese originated in Germany and literally translates to "butter cheese." It's also called "ladies cheese" because it's low in odor. It's very rich on the tongue and quite high in fat. Finally, if you can't find any European cheese in your area, cheese experts in Wisconsin have developed a delicious variety produced in Wisconsin that may serve. While the Wisconsin variety is prepared with pasteurized milk, if properly treated before melting, this cheese is a delicious treat on sandwiches, casseroles, egg dishes and in fondues. If, like many makers of cheese sandwiches, your exposure to "Swiss" cheese has not left a positive impression, please give true Swiss cheese another sampling. American Swiss cheese leaves much to be desired and can be a rather rubbery, tangy disappointment. True Swiss cheese, also called Emmental, is made under carefully controlled conditions with raw milk that's been partially skimmed. American cheese makers generally must make do with pasteurized milk. As true Swiss cheese was developed long before pasteurization was an option, this is a tradition that deserves respect and a second sampling. The fermentation and aging process of Emmental and Gruyere cheeses result in a unique flavor with excellent melting characteristics. Emmental cheese develops large holes during the six month fermentation period. Per authorities with Europe for Visitors Gruyere is made in smaller batches with whole as opposed to partly skim milk. It also goes through a longer aging period than Emmental cheese. During this aging, the cheese dries and develops the sharper flavor it's known for. It’s a bit of heaven, when melted and paired with bread. This delicious cheese, developed and perfected in Switzerland, is robust enough in flavor to stand on its own yet melts well and works in sandwiches and casseroles alike. Gruyere is said to have a nutty, mild flavor, though sharper than regular Swiss (Emmental) cheese. While Emmental cheese is made from skimmed milk, Gruyere is made from whole milk and is aged for a longer period. What Is Gruyere Cheese Used For? 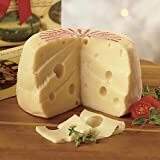 Gruyere cheese is an excellent product for Swiss fondue as it melts well and has a flavor that goes well with breads and other dipping products. Per food experts with The Spruce, Gruyere is often put to use in grilled cheese sandwiches. It's also delicious served cold on a charcuterie platter. ​You can find a substitute, but you'll never forget the flavor of great Gruyere cheese.